The S1 & Under club competitions were concluded at a wet KGS All Weather Pitch on Saturday 4th October as 12 teams competed for the R Clouston Cup and Plate. After 5 hours of competitive action it was a double triumph for Thorfinn as their A team won the R Clouston Cup and their B team secured the R Clouston Plate. In the R Clouston Cup Thorfinn A scored a narrow 1-0 victory over East United A in a closely fought semi-final before facing the league winners and cup favourites Stromness A who had beaten East Utd B 3-0 in the other semi-final. After taking the lead with a scrambled goal which just evaded the Stromness defence Thorfinn were forced onto the back foot for the rest of the match, but put up a stout defence. The Thorfinn goal was credited to Aidan Robertson, who shot crept over the line early in the second half. Stromness nearly snatched an equaliser when they hit the post with seconds to go but in the end Thorfinn’s determined spirit in a very competitive match allowed them to successfully defend their lead. This was Thorfinn’s first win in this competition for 5 years. The Plate final was an all Thorfinn affair and in another tight contest a single goal was enough to secure a narrow victory for Thorfinn B over a young but skilful Thorfinn C team. A brave attempt by the Thorfinn C keeper was not enough to prevent Reid Kemp scoring the winning goal with a powerful low drive. At the end of play Stephen Crawford congratulated all the teams on providing another exciting competition with all the clubs having at least one representative in the semi-finals. He thanked all the referees who helped out on the day and R Clouston Ltd for their continued sponsorship of the tournament. Bob Clouston then presented the trophies and winners medals to the two wet but delighted Thorfinn teams. Stromness A 1 Thorfinn A 0; Dounby B 0 East Utd C 0; East Utd D 0 Thorfinn C 2; Thorfinn A 3 East Utd C 0; Dounby B 0 East Utd D 0; Thorfinn C 0 Stromness A 3; East Utd C 3 East Utd D 0; Dounby B 0 Stromness A 5; Thorfinn A 2 Thorfinn C 0; Stromness A 6 East Utd C 0; Thorfinn C 1 Dounby B 0; East Utd D 1 Thorfinn A 8; East Utd C 0 Thorfinn C 4; Stromness A 9 East Utd D 0; Thorfinn A 10 Dounby B 0. Thorfinn B 0 East Utd B 2; Stromness B 0 Dounby A 1; East Utd A 4 Thorfinn D 0; Dounby A 0 Thorfinn B 0; Thorfinn D 0 East Utd B 4; Stromness B 0 East Utd A 2; Thorfinn B 2 Thorfinn D 0; East Utd B 3 Stromness B 0; East Utd A 5 Dounby A 0; Thorfinn D 0 Stromness B 0; East Utd B 2 Dounby A 0; Thorfinn B 0 East Utd A 2; Dounby A 1 Thorfinn D 0; East Utd B 0 East Utd A 1; Stromness B 0 Thorfinn B 3. 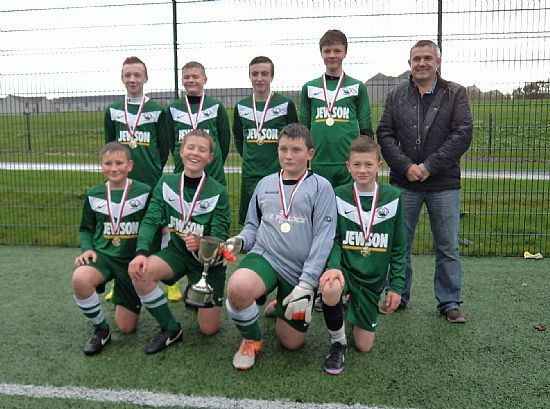 R Clouston Cup – Semi-Finals Stromness A 3 East Utd B 0; East Utd A 0 Thorfinn A 1: Final Stromness A 0 Thorfinn A 1. R Clouston Plate – Semi-Finals Thorfinn C 4 Dounby A 0; Thorfinn B 1 East Utd C 0: Final Thorfinn C 0 Thorfinn B 1. Thorfinn A 1 Stromness A 3; East Utd A 0 Thorfinn A 0; Stromness A 2 East Utd A 2. Dounby B 0 Thorfinn C 2; Dounby C 0 East Utd C 1; East Utd B 14 East Utd D 0; Thorfinn B 4 Stromness B 0; Thorfinn C 5 Dounby C 0; Dounby B 1 East Utd C 1; Thorfinn B 0 East Utd B 2; Dounby B 1 Stromness B 0; East Utd D 0 East Utd C 5; East Utd B 11 Dounby C 0; Thorfinn B 1 Thorfinn C 3; East Utd D 2 Stromness B 3; Dounby B 0 East Utd B 8; Dounby C 0 Stromness B 3. Stromness A 2 Thorfinn A 1; Thorfinn A 1 East Utd A 2; East Utd A 0 Stromness A 1. 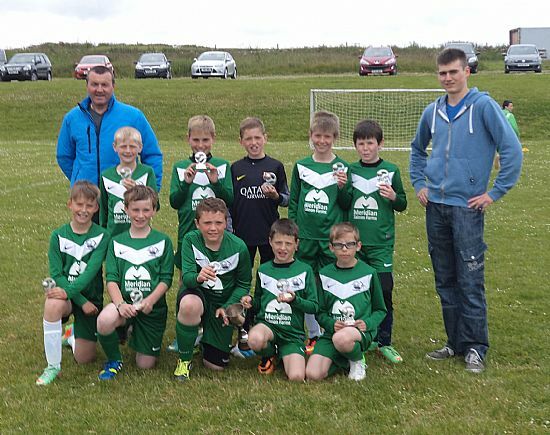 Thorfinn C 2 Dounby B 1, East Utd C 1 Dounby C 0; East Utd D 0 East Utd B 4, Stromness B 0 Thorfinn B 4; Dounby C 0 Thorfinn C 8, East Utd C 2 Dounby B 0; East Utd B 1 Thorfinn B 2; Stromness B 1 Dounby B 2, East Utd C 1 East Utd D 0; Dounby C 0 East Utd B 9; Thorfinn C 4 Thorfinn B 1, Stromness B 2 East Utd D 2; East Utd B 3 Dounby B 0; Stromness B 3 Dounby C 0. 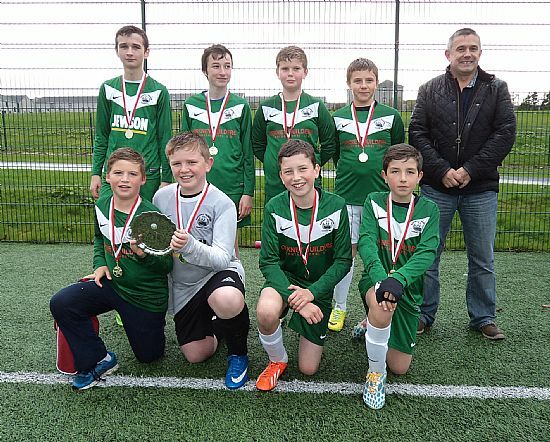 The first week of the S1 & Under leagues were played in near perfect conditions in Stromness last Saturday (17th May). Whilst there are only three A teams competing for the E G Kemp Shield it looks set to be a competitive league with all three teams taking points of each other in the first week’s matches. Early leaders are Stromness who remain undefeated. East Utd B 3 Stromness B 0; Thorfinn C 3 East Utd C 0; Thorfinn B 4 East Utd D 0; Dounby B 3 Dounby C 0; East Utd C 0 East Utd B 2; Stromness B 0 Thorfinn C 2; Dounby B 0 East Utd D 0; Thorfinn B 4 East Utd C 0; East Utd B 0 Thorfinn C 1; East Utd D 0 Dounby C 0; Thorfinn B 1 Dounby B 2; Stromness B 1 East Utd C 0; East Utd D 0 Thorfinn C 9; Dounby C 0 Thorfinn B 2. 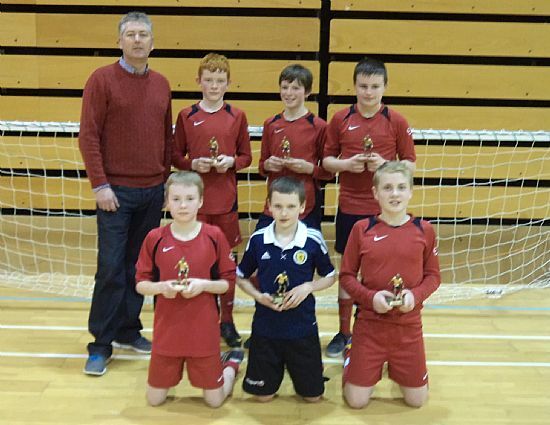 The W Hourston Indoor 4’s for S2 & Under players took place at Picky on Friday 7th March with 9 teams competing. 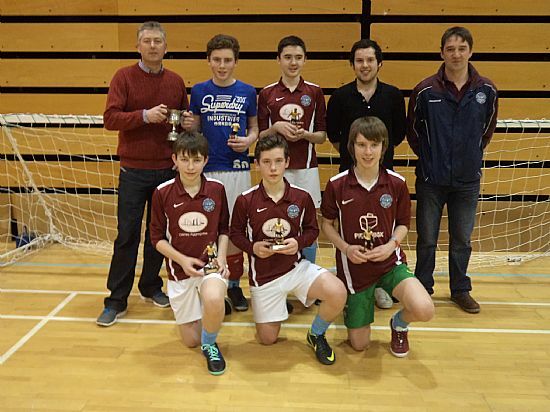 The two most impressive teams made it through to the final with Stromness A playing East United A after both sides had eased through in their semi-final matches. Stromness opened the scoring through Callum Crawford and added a second through Sam Hunter. A long range Andrew Mulraine strike offered hope for East United, but this was short lived as the impressive Hunter scored his second of the match to secure victory for Stromness. At the end of the competition Stephen Crawford complemented all the teams on the excellent standard of football played on the night before congratulating the two finalists. He then handed over to Tom MacPhail who presented the Cup and Winners medals to Stromness and the Runners Up medals to East United. 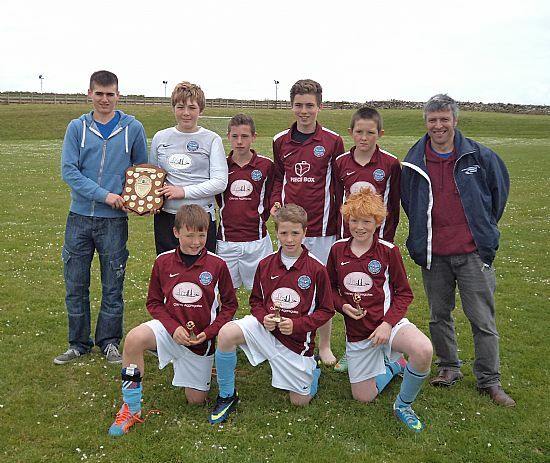 Victory for Stromness halted a run of three years success for East United in this competition.